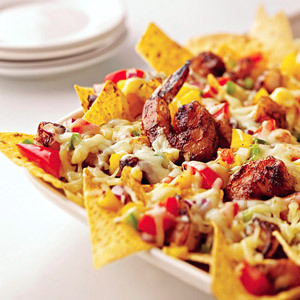 Put a little spice in your game-day menu with nachos that feature jalapeno peppers and Jamaican jerk seasoning. Preheat broiler. For salsa, in a bowl stir together mango, sweet pepper, onion, and chile pepper; set aside. In a large bowl stir together brown sugar and jerk seasoning. Add shrimp and toss to coat. Coat a grill pan or large skillet with cooking spray. Heat over medium-high heat. Add half the shrimp at a time to the pan. Cook for 1 to 2 minutes each side or until shrimp are opaque. Remove and set aside. If desired, coarsely chop shrimp. Spread tortilla chips on a broiler-safe platter or baking sheet. Top with shrimp and salsa. Sprinkle with cheese. Broil 4 inches from heat for 1 to 2 minutes or until heated through and cheese is melted. * Because hot chile peppers, contain volatile oils that can burn skin and eyes, avoid direct contact and wear plastic or rubber gloves. If your bare hands touch the chile peppers, wash your hands well with soap and water.